You know that feeling when your diamond ring or other beautiful piece of jewelry isn't looking its best? Those days are gone. Our new simple, compact, travel-sized, cleaning stick instantly brings the bling back to your engagement ring, wedding band, or other fine jewelry pieces. Our revolutionary new Shine Stick comes in a compact sized container perfect to fit in your purse or pocket book. Simply remove the cap and twist the bottom to release a small amount of our trade-secret cleaning solution into the brush tip. Wipe away the dirt, and grime from your diamonds, CZ, pearls, beads, porous stones, soft stones, enamel and treated gemstones. Safe on gold, palladium, platinum, sterling silver, stainless steel and titanium jewelry pieces. The brush tip is perfectly designed to get behind tight settings and hard to reach places in your jewelry. 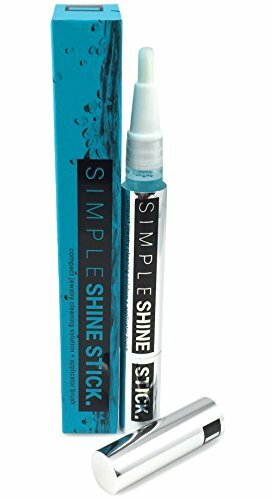 Forget the cheap, abrasive solutions and try the all NEW Simple Shine Stick today! This 100% NON-TOXIC and biodegradable formula works to clean years of build up or simple daily dirt. Our packaging has been specifically designed to reduce plastics and utilize recycled material where possible. Our solution is local and socially responsible. Try Simple Shine today and see why everyone is talking about us! PREMIUM FORMULA, MADE IN THE USA. THE PERFECT GIFT: Engagement gift, bridesmaid gifts, or a little something for that someone in your life. SMALL AND LIGHT WEIGHT: Perfect for travel, our jewelry cleaning brush is portable and fits in your bag. FREE OF TOXIC ADDITIVES: Contains absolutely no ammonia or harsh chemicals. 100% non-toxic and biodegradable. EXCEPTIONAL QUALITY: We use premium ingredients not found in other lesser quality discount solutions. MONEY BACK GUARANTEE: If you don't love it, let us know and receive a full, no questions asked refund.